Marvin Munyon sat in for Jim Schneider on In Focus. He talked to Wisconsin Senator Glenn Grothman and Assembly Representative Evan Wynn about the protests happening in Madison over the Budget Repair Bill. Call your State Assembly Representative and thank them if they voted the right way! WE NEED YOU IN MADISON ON FEBRUARY 19th! Please help support Governor Walker’s budget repair bill! Please join the taxpayers from across Wisconsin on Saturday, February 19th for a rally brought to you by American Majority in support of Governor Scott Walker’s budget repair bill. FEATURING: Andrew Breitbart, Jim Hoff, Ned Ryun, Herman Cain, Vicki McKenna and others. I think the video speaks for itself…Funny they have to let kids out of school to get enough protesters. Now that’s Astroturf! 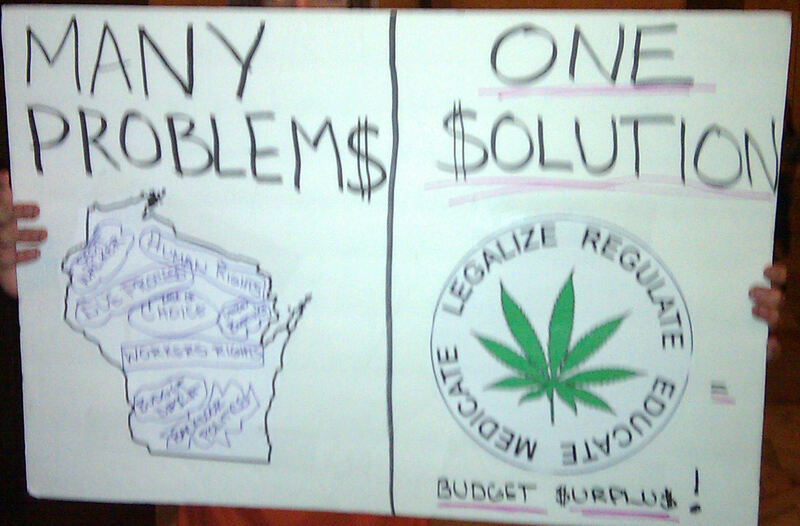 Here is one of the more comical signs we saw in Madison today in the capitol building. The protester holding this sign was an active participant in the protest. I think he may have smoked his pipe a little early and thought this was a legalization rally!